Theresa, part of my work family, makes the most amazing double chocolate cake. It’s light and fluffy – Just chocolaty enough. When I asked her for the recipe, she admitted it was a Better Homes & Gardens recipe, but I don’t care! As far as I’m concerned, it’s her’s. Heat oven to 350. Mix flour, brown sugar, cocoa, baking soda and salt with a fork in ungreased square pan, 8x8x2 inches. Mix in remaining ingredients except chocolate chips. Sprinkle chocolate chips over batter. Bake until wooden pic inserted in center comes out clean, 35-40 minutes. Sprinkle with powdered sugar if desired. *Do NOT use self rising flour for this recipe. ****Cake can be mixed in bowl if desired. 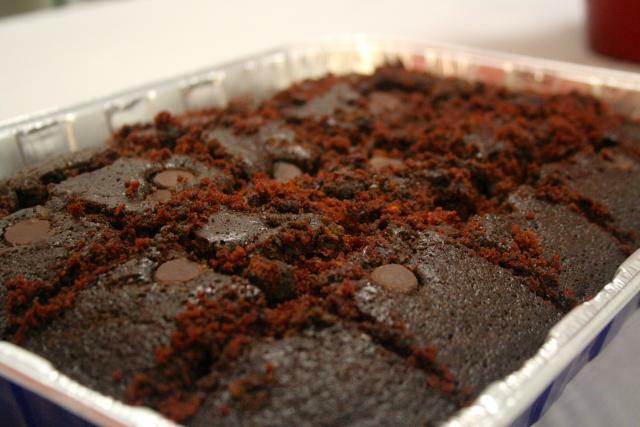 Chocolate-Cherry Cake: Omit water and chocolate chips. Stir 1/3 cup chopped almonds into flour mixture. Mix 3/4 cup water and 1/4 cup maraschino cherry syrup. Stir in syrup mixture and 1/4 cup chopped maraschino cherries with the remaining ingredients. 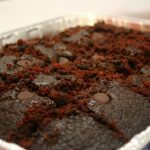 Chocolate Spice Cake: Stir 1-1/2 teaspoonsground allspice into flour mixture. Pumpkin Cake: Omit cocoa, vanilla & chocolate chips. Stir 1 teaspoon ground allspice into flour mixture. Decrease water to 1/2 cup. Stir in 1/2 cup canned pumpkin pie mix with the remaining ingredients.